Help me out! I have no idea what this pretty little wildflower is. Took a hike up in my favorite woods in the Mt Hood National Forest yesterday, and the entire trail was lined with these, as pictured below - not quite bloomed. I was getting anxious that I would not be able to find one that had opened yet, and had almost given up when I spotted this one. But I have no idea what the gorgeous lily (?) is called. Anyone know? 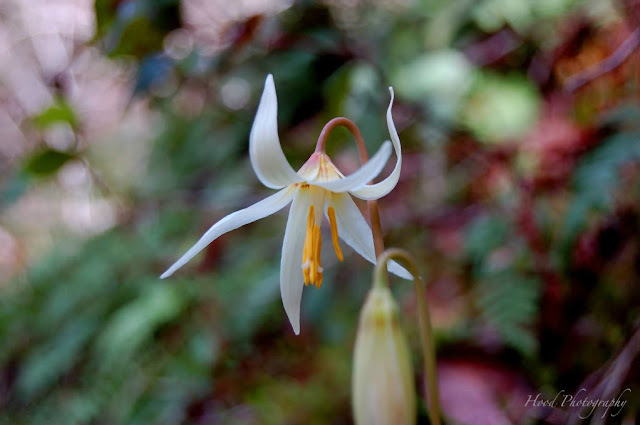 UPDATE: The flower has been ID'd by a few people as a Fawn Lily, Trout Lily, Dog Tooth Violet or Erythorunium. Seems all those are the same flower, and bloom in purple, yellow and white. Thanks so much everyone who answered! I don't know the name, but that is beautiful! No idea of the flowers name, but it is beautiful! Looks like it could be some kind of snow drop variety...? Lovely delicate colours. I think I have seen this flower last year when hubby and I went for a walk to the forest. It's very dainty and the color is beautiful! I'm guessing some kind of lily. Erytrhronium or Trout Lily, which is also know as Dogtooth violet.